Published in Whitehot Magazine, 2012. Original article here. 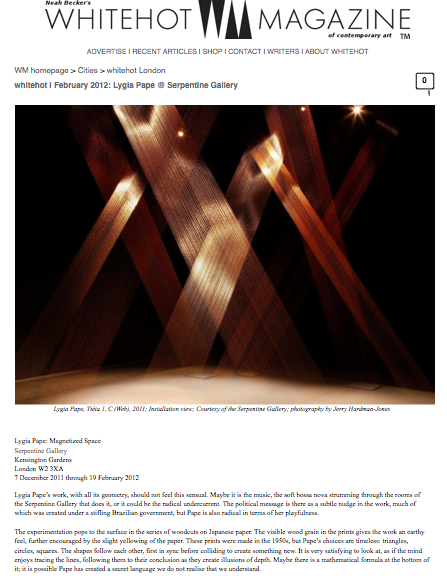 Lygia Pape’s work, with all its geometry, should not feel this sensual. Maybe it is because of the music, the soft bossa nova strumming through the rooms of the Serpentine Gallery, or it could be the radical undercurrent that does it. The political message is there as a subtle nudge in the work, much of which was created under a stifling Brazilian government, but Pape is also radical in terms of her playfulness. The experimentation pops to the surface in the series of woodcuts on Japanese paper. The visible wood grain in the prints gives the work an earthy feel, further encouraged by the slight yellowing of the paper. These prints were made in the 1950s, but Pape’s choices are timeless: triangles, circles, squares. The shapes follow each other, first in sync before colliding to create something new. It is very satisfying to look at, as if the mind enjoys tracing the lines, following them to their conclusion as they create illusions of depth. Maybe there is a mathematical formula at the bottom of it; it is possible Pape has created a secret language we do not realise that we understand. “I want to discover new things. Because, to me, art is a way of knowing the world… to see how the world is… of getting to know the world,” said Pape. The influential Brazilian artist (1927-2004) was a founding member of the Neo-Concrete movement, which sought to include art into everyday life. Pape did this by fusing ideas of aesthetics, ethics and politics into her work, before her late works centred in on emotion and sensation. The most aesthetically striking work in the show is ‘Web’: gold threads are strung from floor to ceiling in a subtly lit room. From some angles the threads seem to drift into nothingness, while two steps later they look like rays of light. Study reveals it is all perfectly logical, but the effect is magical. Some of the strands weave in with each other before veering off again, sort of like Pape’s work itself. “My concern is always invention,” said Pape, and because of this penchant for experimentation, this retrospective consists of many seemingly unrelated elements. In addition to sculpture and prints there are video works rescued from scratchy old tape, each of them boldly sensual and subtly political. The common thread is there: it is magnetic, it inspires reaction. The intriguing ‘Book of Time’ consists of 365 blocks lined up neatly on the wall. Each is the same yet completely different from the other: blue, red or yellow, with stripes, cuts or patterns. They represent days, each one repeated, each one unique. Time often feels more like a river, meaning there is something refreshing about Pape’s attempt to tame it: break it down into segments, describe each one, keep a list. We do not remember each day, but this approach gives us a map. It may seem impossible, but with the right prompts we could recall almost anything, even when our days run into the thousands. Posted on 02/17/2012 by Jess. This entry was posted in Art writing. Bookmark the permalink.